Closing Techniques In Sales are Dead. This Data Explains Why. By the time you try that slick closing technique you read about online, it’ll be too late. Your deal’s fate will already have been sealed. The actions you take earlier in the sales process define your outcome. Not even the fanciest closing technique can change that. Imagine an asteroid on a collision course with earth. When the asteroid is far away, even a tiny shift in its trajectory will make it miss our little blue planet. But if you shift the asteroid’s trajectory after it’s already pierced the earth’s atmosphere, when it’s near the end of its journey…Well, the outcome remains unchanged. Doom. The same thing happens with your buyers. Early in the sales process, you have the opportunity to influence their direction. You can help them frame their problems. You can help them define their buying criteria. Their perceptions are in a state of flux. Their preferences are highly impressionable. Over time, as they wrestle with the problem at hand, these things crystallize. Their perceptions, preferences, and buying criteria eventually reach a point of no return. A slick closing technique will never be enough to untie months worth of knots. Over the last 18 months, we’ve published a stream of research based on our AI-driven analysis of more than 1,000,000 sales call recordings. These calls were recorded, transcribed, and analyzed with AI to identify – with data – which selling behaviors lead to more closed deals. In our database of more than 1,000,000 B2B sales call recordings, 42,945 were closing calls. In other words, the final call in the sales process before the deal is won or lost. This post addresses those calls to determine the anatomy of a closing call that leads to a closed deal, compared to a lost deal. Successful and unsuccessful closing calls look the same in almost all respects, except for one critical element, which I’ll address at the end of this post. There’s almost no difference between a closing call that leads to a successful deal, and one that leads to a lost deal. By contrast, calls that happen upstream in the sales cycle look starkly different in terms of which lead to success and which lead to failure. It’s nearly identical in successful and unsuccessful closing calls. 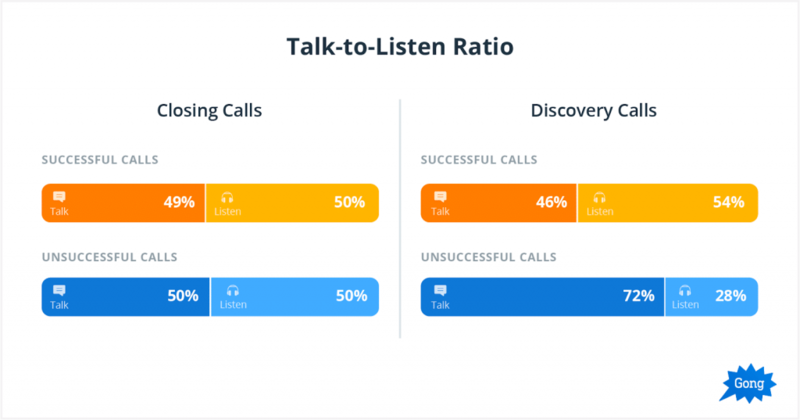 Contrast that with a sharp difference in the talk-to-listen ratio during discovery calls, which happen much earlier in the sales cycle. The talk-to-listen ratio difference between a closed deal’s discovery call and a lost deal’s discovery call is staggering. The difference between their closing calls is negligible. Do Questions Make the Difference? The same thing can be said for the number of questions a salesperson asks. Early in the sales cycle, there’s a linear relationship between the number of questions you ask, and your likelihood of closing a deal. But late in the game, there is no such correlation. 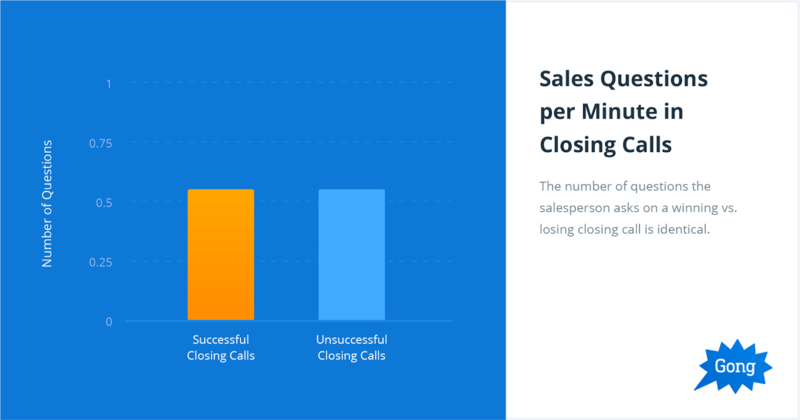 In fact, the number of questions the salesperson asks on a winning vs. a losing closing call is identical. 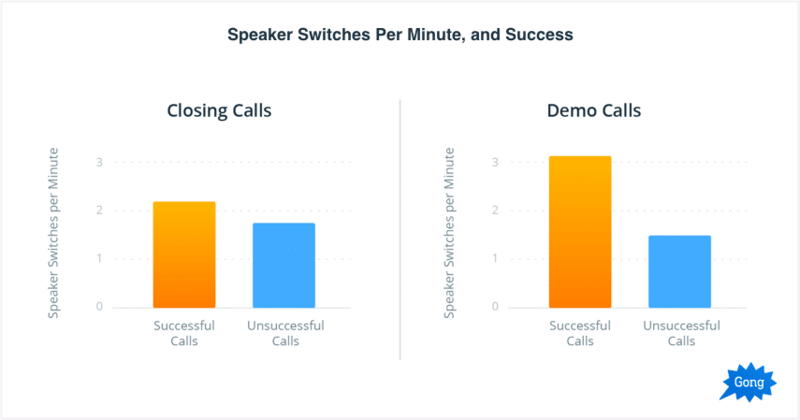 Let’s look at another data point: speaker switches per minute. It’s a measure of whether a sales conversation is interactive. Think of it as the amount of “ping pong” in a conversation; the back-and-forth dialogue. Upstream in the sales cycle, this metric matters greatly. Successful demos that happen early in the sales cycle are almost twice as interactive as unsuccessful demos. But again, that’s not the case with closing calls. They have more or less the same number of switches per minute whether the deal succeeds or fails. It’s easy to spot how different they are. Now look at closing calls. It’s tough to find a meaningful pattern that differentiates the two closing calls. We found the same pattern for how you handle the competition. 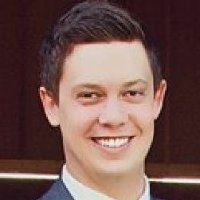 When you discuss competitors with your buyer early in the sales cycle, you have a greater likelihood of winning the deal than if discussions of your competitors were absent altogether. 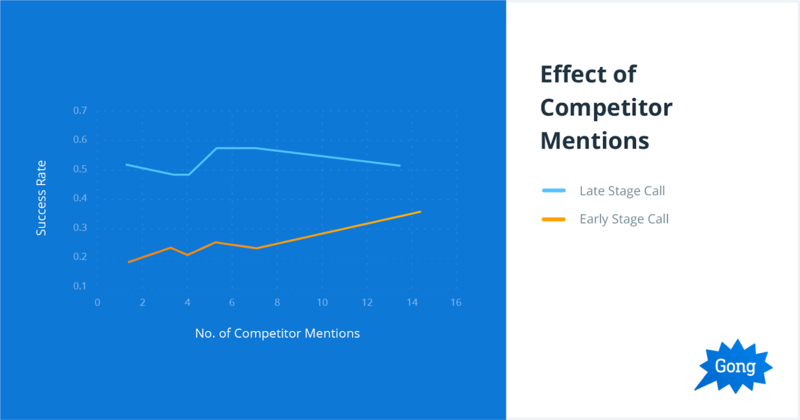 But when you discuss the competition late in the game, you are less likely to close the deal than if discussions of your competitors were absent. This is yet another testament to our discovery: What you do early in the sales cycle is far more influential than what you do late in the sales cycle. If you discuss your competitors early on, you have the opportunity to set the rules of the game in your favor. But when you’re trying to convince your buyer away from the competition at the final hour, your efforts are futile. You’ve already missed your chance. Competitive deals are won early, when the battleground is still fertile. Competitive deals are won with discovery techniques, not closing techniques. I could go on forever, with data point after data point. But I’m sure the point is becoming pretty clear for you. It was the same story for every other metric and sales behavior we analyzed. The difference between a successful and a losing sales call early in the sales cycle is staggeringly different. 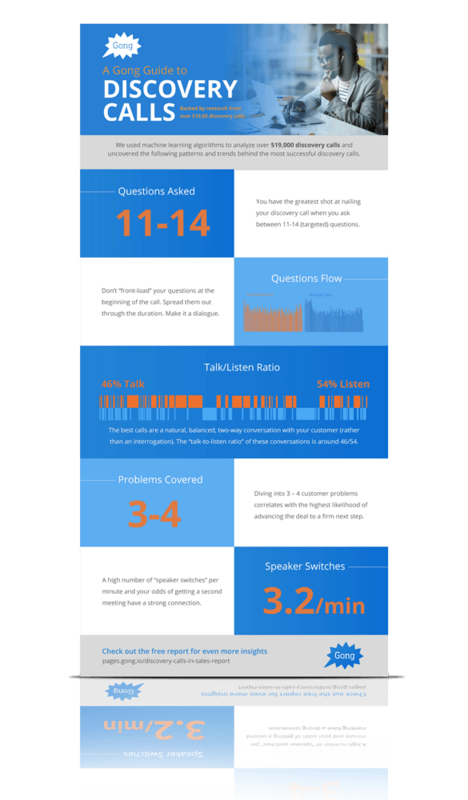 The difference between those sales calls late in the game? Not so much. We did find one vital difference between closing calls that lead to success and closing calls that lead to failure. But I have to warn you. It has little to do with you as a seller and everything to do with your prospect. 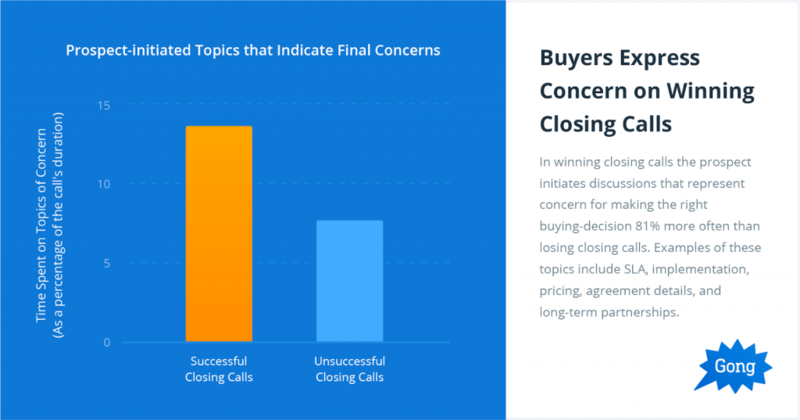 The topics of conversation that the prospect raises on a successful closing call are totally different from the topics they raise on an unsuccessful closing call. Successful closing calls involve topics of conversation that indicate the buyer is nervous about making the right decision. All of these topics indicate that the buyer is ready to make a decision; they just want to ensure it’s the right one. Naturally, they seek reassurance about things that can make the project a success. Your Job Isn’t to Use Closing Techniques, It’s to Lead. What this means for you as a seller is that your job becomes one of leadership. Pushing to close will only exacerbate the buyer’s nerves. Manipulation and pressure will have a negative effect. Your job isn’t to close. Your job is to lead. Lead the buyer through their emotional hurdles. Provide authentic reassurance. Don’t shy away from the concerns they’re raising. Clear up any confusion that still exists (remember, the confused mind always says “no”). Convince your buyer with your actions, not just your words, that you’re in this for the long haul. And yes, part of walking your buyer from a state of uncertainty to certainty is exercising decisiveness and recommending a decision. But that’s not a closing technique. It’s a mode of operation. It has more to do with the character you convey than a few slick words you spat at your buyer. It’s a call for leadership, not manipulation. I can already hear the critics. The takeaway – aside from demonstrating strong leadership – is to improve how you execute during the front end of your sales process. I can’t think of a better way to do that than to master how you run your discovery calls. Why? The discovery call dictates the trajectory of your deal. 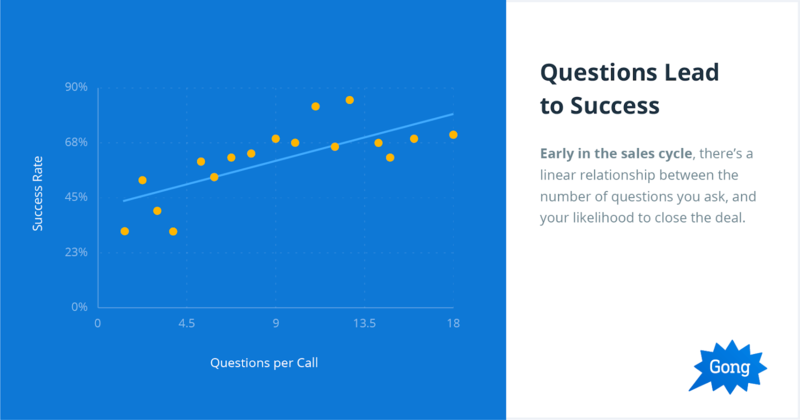 We analyzed over 519,000 discovery calls to identify what leads to success. The most important insights we learned are summed up in this cheat sheet. You’ll be able to implement what you learn immediately. Why not print the cheat sheet and stick it on the wall so everyone on your team knows what to replicate?